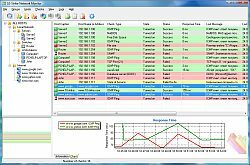 10-Strike Network Monitor is a network device status monitor which allows you to obtain online data on the time a device becomes available and the time it goes out, and thus ensure a prompt response to various events. The program's functionality is based on periodic polling of devices. It can check devices via the ICMP, TCP, SNMP, HTTP, FTP, ARP, DNS protocols. Monitor SQL databases, files, folders, free space on disks, VB and JS script results. ...... It can send an ICMP packet (ping) to a device, attempt to connect to the required TCP port over the network, access a database, or check a managed switch (via the SNMP protocol), etc. You can use any check from the list of supported checks. Depending on the result of the checking function, the device being polled obtains a corresponding status. If the check is successful its color is displayed green; if failed a�� it appears in red. 10-Strike Network Monitor stores results of all the monitoring checks being run, gathers statistics, and displays the response time diagrams in the real time for any host you select in the list. You can watch the history data as well. Qweas is providing links to 10-Strike Network Monitor 2.1 as a courtesy, and makes no representations regarding 10-Strike Network Monitor or any other applications or any information related thereto. Any questions, complaints or claims regarding this application 10-Strike Network Monitor 2.1 must be directed to the appropriate software vendor. You may click the publisher link of 10-Strike Network Monitor on the top of this page to get more details about the vendor.